Risk aversion is highly influenced by an individual's experiences, particularly the economic environment they experienced during their childhood. People who grow up in different economic climates tend to manage money very differently. A risk-averse person might prefer to work as a low-paid employee with a great deal of job security rather than strike out on her own and become a self-employed entrepreneur—even if an entrepreneurship would likely result in earning a large sum of money. With the opportunity for more income comes the risk of losing her investment in time or money. Technically, it could go either way. Risk-averse people tend to bet on sure things. They're not gamblers, even if rolling the dice just a little might result in greater rewards. 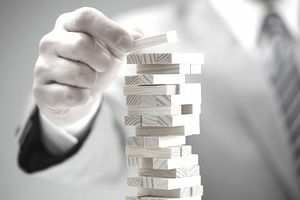 Many risk-averse people make choices by putting excessive weight on the worst possible scenario in a situation, far beyond the actual probability that such a scenario will actually occur. Likewise, a risk-averse person would prefer a low but sure rate of return when investing her money, such as that provided by a bank savings account or a certificate of deposit rather than attempt a much higher potential rate of return on equities. After all, equities are highly variable and can potentially provide a negative result. Financial advisors, financial planners or insurance sales agents are all examples of financial professionals who must understand their clients as well as possible in order to best serve them. Just understanding the time and place in which a client was born can offer useful—although hardly infallible—insights. These insights can aid in client retention because a risk-averse individual will most likely go elsewhere if they feels pushed or pressured to take an action that they do not feel comfortable with. The goal is to help them within their own personal constraints. Consider a child who never knew for certain when they would eat again compared to one who was lavished with the most recent and expensive fads in toys. As an adult, the first child would most likely want to be very sure where their next meal was coming from as an adult. He'd want to know that the money for that meal was safely in the bank, and they would not risk it on a situation of uncertain outcome even if the odds of success were in their favor. Another classic example is people who grew up during the Great Depression of the 1930s. As a group, these people tend to be very conservative about money and very risk-averse about a job or career changes. Many of them avoid stocks, given memories of the Great Crash of 1929. But many spendthrifts grew up during the Great Depression, too. Many siblings develop radically different attitudes about money even when they're raised in identical circumstances. A more recent and famous example would be that of hedge funds, who place bets against their main holdings in a process called "contrarian investing." Most funds operate on an 80-to-20 ratio, where 80 percent is their core holding, and 20 percent is used to "hedge" their bets.